If you guys have been keeping up with my skincare segments, you would know that my main reason for skincare product hopping is because I would preferably like to find products that are natural and help with my acne and the overall dullness of my skin. I discovered a Lush store in the local mall upon moving in with my fiance. Lured in by the packaging, nice smells, and promise of natural products, I started my relationship with the Lush brand. The first cleanser I was suggested by the clerk was Angels on Bare Skin. I was really there for Herbalism, but they were all sold out. When I told her about my acne and brightness problems, she immediately reached for the container and told me she used it all the time. My first impression of using Angels on Bare Skin is that it was kind of a pain to use. Some of Lush’s cleansers are what they call “cleansing rolls” and you have to take a small pinch of the product and roll on your hand with a couple of drops of water. You roll it until it turns into a paste then rub it into your damp skin. As you can imagine, I soon learned that this was very messy and started only using it in the shower. I liked the smell just fine. It smelled like lavender and somewhat herbal. But after using the whole tub of this stuff, I saw no change in my acne or any improvement in the brightness of my skin. I wouldn’t buy this product again. I love using toners. They are actually my favorite part of my skincare routine. After I use a cleanser, they get any part of your face you might have missed and they make the face feel so fresh. I opted for the Eau Roma Water Toner from Lush because tea tree never works for my acne. I’ve had really good luck with rosewater based toners for brightening and acne. They also smell really great. I found that I had better luck with cheaper rosewater toners than this one. There was no change in my acne nor did it help with the dullness. Though it did smell good, I wouldn’t buy this again either. A clerk suggested this moisturizer to me when I told her I had oily skin. Lush’s moisturizers are very expensive, so I left with a sample. I’m really glad I didn’t buy a whole container. I just can’t get past the smell. This stuff smells really funky! Not to mention, I didn’t like how it felt under make up and I could just get a cheaper moisturizer that I actually like. I really liked this product…at first. When I bought my first bottle, it did really help keep my acne at bay. However, when I bought my second bottle I noticed that the scent was off. I actually liked this scent a lot better, however since these products are handmade I was guessing that the ingredient ratio was off. The second batch really didn’t do as good and I have since discovered that products with stronger acne fighting ingredients help my skin better anyway. So, this is another one I won’t be buying again. Just because I didn’t like any of these products doesn’t mean I have totally given up on Lush. I actually have a lot more products from them to review and will try more. What I have learned is that a Lush facial routine isn’t for me and sometimes cheaper brands are the way to go. I would like to thank the few of you who gave me feedback on some questions I had yesterday. Only one of you gave advice about my itchy scalp problem. Shout out to Kimmykimmycocopuff (that is such a cute screenname!) So, I will most likely follow some of that advice and record the results here. We actually don’t have hard water around here, so I’ll be on the look out for that Paul Mitchell Tea Tree shampoo at my local Sally Beauty Supply soon. As for the video reviews, I actually have a nice handheld video camera. Unfortunately, I must have forgotten to pack the charge cord when I moved annnd my grandmother might have put it up in storage. So, for now, I may be testing the waters with videos with my laptop webcam. I’m thinking about posting up my first video possibly tomorrow. I didn’t know what to talk about, but then it hit me. A few months back the fiance and I finished up my favorite animated TV series, Daria. This show was a huge part of my life when it aired and still is today. It was his first time seeing it. I thought it would be razor to do a retrospective video together (if I can get him to agree to it). What do you guys think? If not tomorrow, I think that will be the first video. I’m going to try to do a balance of both writing and film. This is going to be a fun experience. In other news, I want to give a big thank you to those at https://bookidote.wordpress.com/. For nominating me for the Sisterhood of the World Bloggers Award. When I first started this blog, I never thought I would get the amount of recognition that I have been receiving. I really am very appreciative that all you readers out there want to see what I have to say. I am guessing that since this is a “sisterhood,” my choices should be ladies. So, here we go! What are your September favorites ? (books, music, products,etc.) I never really did the whole “monthly favorite thing.” I just like what I like at any given time. But I can tell you about some wonderful products I bought this month! I recently discovered LUSH and have fallen in love! For those of you that don’t know what LUSH is, it’s a homemade cosmetics store that makes everything by hand and uses natural ingredients. So far I’ve gotten Grease Lightening (an acne fighter), Angels on Bare Skin (a facial cleanser), Eau Roma (facial toner), Imperials (facial moisturizer), and Happy Hippy (body wash). So far I have used Angels on Bare Skin, Grease Lightening, and Imperials. I can’t wait to try the rest! What is THE ONE BOOK everyone should read at least once in their lives? The Perks of Being A Wallflower. That book really helped me during a dark time. Where is your favourite place to read ? I used to love to read outside on my college campus. I guess I’m an outdoorsy reader. I like to read in coffee houses too. How did you come up with your blog name ? I actually took it from lyrics from the Everclear song “Rocket for the Girl.” I thought it summed up how my fiance makes me feel. Look it up and give it a listen! I also met the lead singer of Everclear back in June. What is the best piece of advice anyone has ever given you? I honestly don’t know. As a blogger, what do you think we can contribute to the community? A different perspective. Best comment on your blog so far. I’ll have to comb through them and get back to you on that. What was the first book you ever found yourself attached to? What was the first television show you ever found yourself attached to? Describe an event that actually scared you. What movie can you just not watch? Why? If you could date a fictional character who would it be? If you could create your own perfect partner, what traits would you give him? If you were granted three wishes by the Robin Williams genie, what would they be? Hi everyone! I know I’ve been off the radar for a while now. Things have been a bit busy lately. I’ve been swamped with my freelance writing lately. I took my library test last week, so now it’s just a waiting game. Hopefully, I passed my exam so that my resume will be sent out to all those libraries. That would be my dream job. I must admit it was much harder than I thought it would be. But the instructor informed me that all I needed was a 60. It won’t be too long till I post another book review. 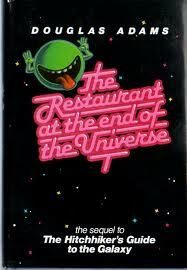 I’m getting closer to the end of Hitchhiker’s Guide to the Galaxy. I’m reading the whole collection in one book, so I’ll review each individual novel separately. I’m going through it slower than I would like. It just isn’t holding my attention too much just yet. As for my beauty reviews, I’m stilling going through the Body Shop products. At the moment, I’m not too impressed with the results. However, I’m still working on the Vitamin E line and there is still the Aloe Vera line sitting in my bathroom. I ran out of moisturizer though, so I have tried the Aloe Vera moisturizer. Meh. I have discovered LUSH recently and decided to try their “Grease Lightening” acne fighter because my Terminator Ten acne fighter wasn’t as good as the one that came in the AcneFree set. Wow. I love that Grease Lightening stuff! It really reduced some of my larger zits fast. It is really pricey though. It’s about $15 a bottle. But the nice packaging and promise of handmade natural products have reeled me in. The Aloe Vera moisturizers for the Body Shop are really small, so I have ordered the Imperials moisturizer from LUSH and I can’t wait to try it. Before I end this entry, I want to give a shout out to http://veganneeds.com/ for nominating me for the Bloggers Recognition Award. Thank you so much! Sorry, I didn’t post it up. I’m a little burned out on typing now. Hopefully, it won’t be too long till the next entry.